Accent the architectural beauty of your home and improve its appearance and real estate value with a distinctive bay or bow window. Premium quality vinyl windows from Falls Glass Service are fashioned into a meticulously handcrafted wooden frame that is designed and custom-built especially for you! A bay window is a decorative type of window that projects outward from the wall, creating a sense of more open space and allowing in more light. It is typically constructed from one central fixed window running parallel to the wall. This window is then flanked by two other windows, usually casement or double-hung styles, attached at an angle. 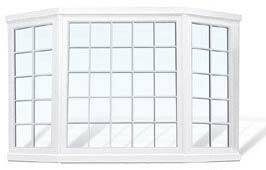 The bay windows may be ordered with your choice of traditional double hung or modern casement side vents flanking a center picture window. Like bay windows, a bow window project outward from a wall. While a bay window is composed of three main panels, a bow window is constructed of several. These panes join to form a gentle curve, or a bow shape. Also similar to a bay window, a bow window’s center is typically fixed and its side sashes are casement windows. 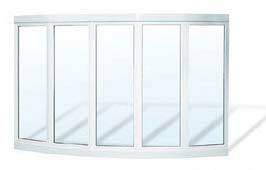 Bow windows can be built as 4, 5, or 6 lite models with different groupings of casement and picture windows. The extra-heavy hardwood frame is available in birch or oak or with decorative laminates for the seat board.